This will probably mark the last horror movie roundup to be featured on The Author’s Files because there’s very little middle ground on people’s feelings about the genre. Either you really love horror, monster, or psycho-thriller movies or you just don’t care at all. My roommate falls within a nebulous region of hating scary movies while he’s watching them but always begging me to join him for more mental torture the next day; however, he’s an exception to the general rule. I went with Shaun of the Dead and Caché for this final entry, the former because it appeals – strictly in theory – to a broader audience than just zombie fans, the latter because it was too ideologically repugnant to ignore. The Author’s Files will still run reviews of these flicks in the future, but the variety will probably be confined to more recognized or recent releases that also have enough subtext for me to form an original opinion on them. If you fall under the tent of rabid horror-consuming zombies, we have a new website written just for you called Descent Into Heck, because Hell was taken, and Heck is kind of funny, unlike Shaun of the Dead. Check it out. The new blog. Not this “romantic comedy, with zombies”. I suppose I should offer a brief preamble to this piece, as its thesis will no doubt prove polarizing or sensational. Hear me out. Shaun of the Dead is a comedy movie featuring zombies, not a zombie movie featuring comedy, and so it should be criticized on its merits as a comedy. Edgar Wright imbues his film with a light and cheeky tone that disbars it from being viewed as a seriously frightening or dramatic horror film. Yes, there’s a fair amount of zombie culling and gory imagery that’s to be expected of any zombie movie worth its salt, but as satisfying as the makeup effects and exaggerated violence are, they don’t make or break the movie in the same way that they define the horror classics of George A. Romero or Sam Raimi. 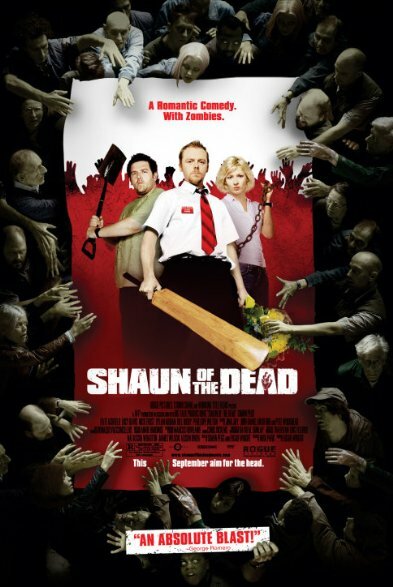 What distinguished Shaun of the Dead from its contemporaries was an overtly humorous slant on the undead apocalypse, and so I feel it’s most fitting to focus on this aspect rather than on the makeup, special effects, or cinematography, all of which are fine but don’t make Shaun of the Dead what it is. Here’s my argument: Shaun of the Dead is the Boyhood! of horror comedies in that everybody pretends to like it but no one really does. It’s not dreadfully offensive to your intelligence and it has its fleeting moments of inspiration, but the film as a whole is so dull that it’s inconceivable why anybody who’s not a horror addict or a critic would sit through it. The first time my roommate and I tried watching it, we made it about fifteen minutes in before I started hearing him passing gentle z’s from the couch. I myself was technically awake but so detached from the film that I hadn’t mentally registered anything that happened, in the same manner that I often find myself “reading” a book, hitting the bottom of a page, and abruptly realizing I didn’t process any of the words above. Granted it was after midnight and we’d just finished watching another, much more stimulating horror satire, but it’s undeniable that Shaun of the Dead obliterated any resolve we had to carry on with our days. Out of Christian grace and charity, I decided to give Shaun of the Dead a second chance on a later solo viewing, and was profoundly disappointed when it didn’t get any better than those first fifteen minutes. I won’t say that it’s without humor. I chucked more often at it than I ever have at an Amy Schumer video. Here’s a list of all the somewhat funny or clever things that happen in Shaun of the Dead. * Shaun’s fat slacker friend Ed asks him, his girlfriend Liz, and some others, “Can I get any of you c***s a drink?” It’s funny because Ed is a douchebag and Nick Frost’s delivery is perfect. * Zombies shamble and bob their heads to the beat of the opening track. * Shaun tries to look cool by jumping over a fence that collapses underneath his weight. * Ed greets Shaun and his friends by saying, “What’s up, niggas!” It’s funny because Ed is a douchebag and Nick Frost’s delivery is perfect. * Shaun and his friends beat up a bunch of zombies and flick the lights on and off in sync with Queen’s Don’t Stop Me Now. This is really the only part worth watching. … That’s it, I’m afraid. Nothing else in this works on a scientific, objectively funny level, and I’m not saying that because I dislike Edgar Wright’s style (Scott Pilgrim is hilarious in its madcap, comic-booky way) or don’t get British humor (I quite like Hitchhiker’s Guide, some of Monty Python, and Mr. Bean). I’m saying it because it’s a fact. Let’s go through the movie point by point. So it opens in a bar and right off the bat there’s too much frank discussion of feelings and relationships without enough sarcastic quips to match the comedic tone. Shaun currently lives with his best friend, another male and a bit of a childish jerk who plays video games all day and screws up everything he touches, because characters acting stupidly with no cause other than that they’re stupid is apparently funny. There’s a ton of scenes in Shaun of the Dead that would be labeled cringeworthy or lowbrow if any other director made them, but because Edgar Wright is a respected hipster cult leader in the same camp as Wes Anderson he can get away with crimes like having Nick Frost impersonate an orangutan or showing Shaun and Ed repeatedly smack two zombies into the ground with a cricket bat and shovel. Anyway, Shaun has lady troubles and shortly gets ends up getting dumped over his inability to commit to a more serious relationship. The rest of the movie isn’t so much about him surviving a viral outbreak as it is about reclaiming his lost love, but both he and Liz are such thin characters that it’s not clear why he wants to reconnect with her. He’s a nice guy who likes going out for a drink, and she’s a hot blonde, I guess… is there a deeper side to them that I missed? He goes to work and tries to corral a bunch of impertinent hooligans into shape, but just ends up spilling ink in his dress shirt pocket, about which one of the hooligans laconically remarks, “You’ve got red on you.” Characters pointing out that Shaun has red on him will become a running gag of sorts, but it wasn’t even a joke the first time around, and all the subsequent occasions are only jokes because they’re references to the first time it happened. Why would Ed point out that Shaun has blood on his shirt when they’ve just finished beating up two zombies in their backyard, Ed has blood on his shirt too, and they have no immediate plans to go out in the undead-infested public? Why would Ed say, “You’ve got red on you,” when he knows it’s actually blood or brain matter? Why wouldn’t he just say, “You should change your shirt,” or ignore it altogether because human civilization is falling to pieces around them and they have much more pressing concerns? The only reason Ed says, “You’ve got red on you,” is because Edgar Wright is trying desperately to create a quirky, oddball comedy and doesn’t even care about the situational context of his one-liners. After dispatching the backyard invaders by throwing vinyl records and swinging away with the cricket bat, Ed and Shaun form a plan to rescue the latter’s mom and girlfriend, get away from the zombies, have a cup of tea, and wait for the whole thing to blow over. The one thing they’re undecided on is where they should seek sanctuary, so Edgar Wright plays through the same scene three different times in quick succession with almost imperceptible differences aside from ending in a different setting. The only thing that’s remotely funny about it is how swiftly the editor breezes through the sequence each time, compared to similar battle planning montages in The Lego Movie, Thor: The Dark World, and, well, every other movie with a battle plan ever. It’s just not that funny. Likewise with the repeated tracking shot of Shaun walking to the convenience store, tripping on the sidewalk, and blithely interacting with people who become zombies the second time through. There’s no realistic explanation as to why Shaun would ignore the blood on the glass or floor, the overturned trash cans, all the moaning homeless people, or any of the telltale zombie signs, so why are there so many stupid scenes of him cluelessly attempting to bond and socialize with the undead? I don’t think that Wright was trying to make a deep, insightful commentary on the mundanity and routine slog of a service worker’s life; this isn’t Boyhood! or some quasi-philosophical, awards crap like that. It’s a movie about a man-child dealing with friendships that are falling apart and proving his mettle by taking on hordes of the undead with a less than ideal artillery. Another common source of humor in Shaun of the Dead is contradiction and hypocrisy. Characters say one thing – “I’m perfectly capable of keeping my work separate from my social life,” “He’s not my [gay] boyfriend,” or “We should turn the lights on,” –, then say or do something directly afterwards that implies the exact opposite. It’s probably the easiest joke in the book to write, and Shaun of the Dead is stuffed chock-full of them. Then there’s the vocabulary. Early on, Shaun asks Liz what “exacerbate” means, and guess which word comes back multiple times from various persons trying to show how smart they are. The two heroes also disdain the term “zombie” in referring to the infected, calling it the “zed word”. Ha ha. What’s the joke? The “special word” trope is such a cliché that no one could be bothered to delineate all the movies that use it. There’s Warm Bodies, for one. Shaun of the Dead isn’t quite as bad as Warm Bodies (really thorough thrashing probably forthcoming at Descent Into Heck), but the squandered directorial vision of Wright renders its generic zom-rom-com script that much more disappointing than Warm Bodies’ equally generic zom-rom-com script. It’s nowhere near as entertaining as The Evil Dead or Zombieland, which came several years later and was also highly overrated. Zombieland at least had strong, well defined characters who didn’t all kill each other at the end, and it united crazy Woody Harrelson, awkward Jesse Eisenberg, and brunette Emma Stone in one really enjoyable, violent, corny road trip movie. Shaun of the Dead only has such a glowing reputation because it came First and all the actors speak in articulate British accents. Who am I to begrudge a fellow American for liking a fancy British accent, but Shaun of the Dead is about as funny as watching maggots eat their way out of a caterpillar’s dangling corpse, which, for those who’ve never witnessed such a thing, is not a very funny sight to behold. The cover of the Caché DVD advertises it as a Hitchcockian thriller, “only creepier”, but to the best of my knowledge Alfred Hitchcock never capped his movie off by calling the largest segment of his viewers unrepentant accomplices in the self-destruction of underprivileged people who do not look like them. This may be the most dishonest and insulting film I’ve ever made the mistake of giving my attention and time. The first hour sets it up as a drama about an unknown stalker terrorizing an upper-class family in France, sending them videotapes of their apartment exterior as well as creepy, childlike illustrations of stick figures with bloodied features, including a decapitated chicken. We learn that the stalker was briefly the protagonist’s adopted brother when they were children, before the wealthy only child falsely accused the Arab orphan of purposefully intimidating him and got him sent away to an orphanage that would doom him to an inferior education and consequential life of poverty. There’s still some debate online about the true identity of the stalker, but I think it’s easiest and most straightforward to accept the most obvious explanation, which is that the stalker was in fact the Arab colluding with his son and that both men were simply lying about their ignorance of the videotapes. After all, people tell lies when they don’t want to get caught, and Muslims tell lies to themselves all the time anyway. Some people think that the rich white guy was just stalking himself, for kicks or something, because he never searched the street outside for hidden cameras and because he’s the only other individual who would know where he was raised. I choose to think that Georges’ passing by the camera a second time is just due to bad writing and direction, as Michael Haneke gives me no indication within this film that he’s proficient at telling an intelligible story. There are so many other plot holes and unresolved motivations that it requires no stretch of my imagination to dismiss the character’s oversight as another flub by Haneke. Nor does it make any sense how or why the rich white guy would sneak a hidden camera into the poor Muslim guy’s apartment and retrieve the footage from it to turn over to his boss (this serves no purpose in advancing the plot). It doesn’t make any sense either why the poor Muslim guy would install a hidden camera in his room, especially if his end goal was to frame the rich white guy for murder, which video evidence would certainly refute, but at least he would have been physically able to create the setup. Aside from the Arab and his son, there are literally no other suspects in the movie and every single clue points to someone who has vivid memories of events from the main character’s young childhood. So the poorly educated 99%er commits suicide right in front of the privileged white guy who got him evicted as a spoiled, selfish 6-year-old boy. The rest of the movie is about convincing us just how arrogant and stubborn but privately guilt-ridden the rich man was for making the poor man slit his own throat. The bully puts the victim through living hell, making him constantly fear for the safety of himself, his wife, and his son, and then the victim is the one at fault when the bully discerns that #BullyLivesDon’tMatter and chooses to end his own despair right there. On the DVD’s behind-the-scenes interview, Haneke says something like, “While the protagonist is technically right in saying he was only six at the time… isn’t that an excuse we all would make?” Yup. It probably is. I’ll confess to knowing nothing about the European-Algerian relations that form the backdrop of this movie’s plot, but I don’t think I need to as Haneke himself claimed that the story has universal parallels for every world society that harbors hidden “political triggers”. Caché is one of the worst movies ever made, a simultaneously sycophantic and self-righteous Social Justice screed that stems from a warped view of human self-determinism and essentially accuses its primary demographic of disabling or even killing anyone who isn’t as well off as them. The dialogue stinks, tension and release are nonexistent, and the narrative proudly wallows in its artsy ambiguity, never justifying the 110 minutes it takes the viewer not to figure out who was stalking the family or for what reason. The only redeemable thing about Cache’s execution is cluing me in that Funny Games probably isn’t necessary viewing for indie horror fans. Rated PG-13 for sexual references and blood coming out of her wherever. Yes, it’s long, but we will never apologize for doing “good journalism”.